According to this week’s petroleum and oil weekly update prepared by the Energy Information Administration, there is an analysis on the high levels of operations in refineries in the Central U.S. During last week there was a drop in the U.S stockpiles: the total U.S oil and petroleum stockpiles declined during last week by 7.2 million bl. Further, crude oil stockpiles also fell by 6.5 million bl. There was an increase in refinery inputs imports but a drop in imports and production. Finally, the prices of gasoline and diesel in the U.S rose again during last week. For the week ending on July 27th, U.S. Petroleum and crude oil stockpiles declined by 7.2 million barrels and reached 1,801.3 million barrels. The current oil stockpiles are still similar to the quota as of last year: the current crude oil stockpiles are 6.1 million barrels below oil stockpiles levels of the parallel week during 2011. 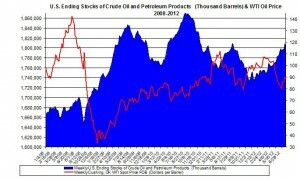 U.S. Ending Stocks of crude oil also fell by 6.5 million barrels and reached 1,069.5 million barrels. The U.S. Ending Stocks of Total Gasoline also decreased by 1.04% compared with last week’s stocks; it reached 207.87 million barrels. 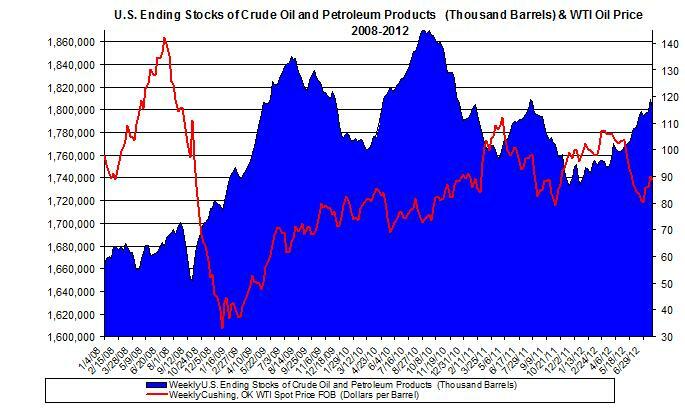 The chart below shows the changes of petroleum and oil stockpiles and WTI crude oil price between the years 2008 and 2012. During the last couple of years the lagged linear correlation between WTI oil price and current oil stockpiles was -0.173. During last week refinery inputs and imports fell while oil production rose. The crude oil refinery inputs (4 week average) decreased to 15.67 (million b/d), a 0.1% gain compared with the week of 20/7/2012, and were 1.6% above the same week last year. Crude oil imports decreased last week to 8.901 (for 4 week average) compared with the week of 20/7/2012; they were 4.6% below the average during the same week last year. Propane stocks rose by 1,273 thousand barrels and reached 66,018 thousand barrels. The average U.S. gasoline retail price increased by a penny to $3.51 /g – $0.2/g lower than the price during the same week in 2011. The national average Diesel price also rose by 1 cent to $3.8/g; this price is $0.14/g below last year’s average price at same time. A detailed analysis of oil prices for the week ending on July 27th is herein.